Sunday April 22nd 1894 We went to church this morning in the Surry. I got dinner after I came home and before I had my work done up Ott & Fanny came out. In a little while Lee & Mother came and Charlie & Tishie Hedges. Ott & Fanny would not stay till after supper but the rest did. We had a splendid visit. The weather has cleared of very nice. I wrote some in the evening. 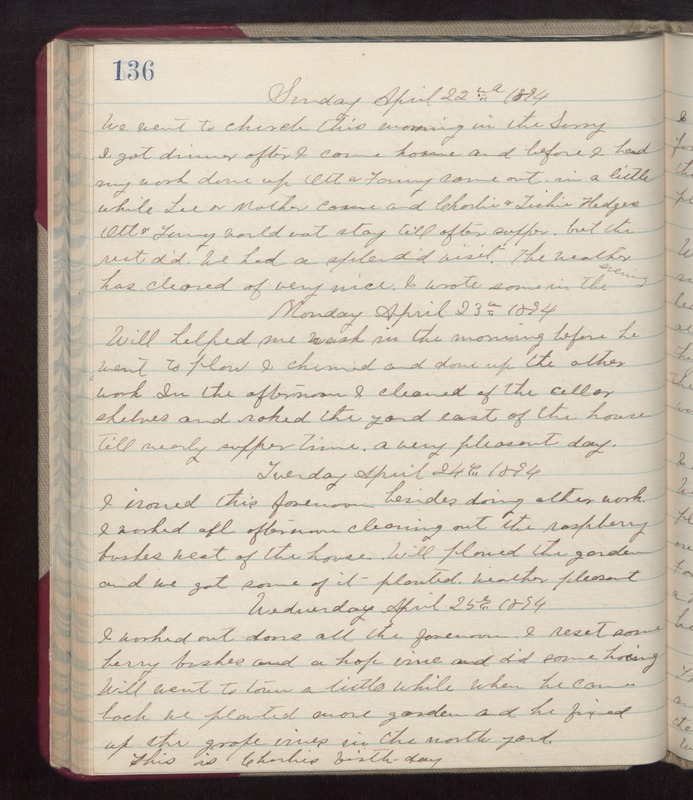 Monday April 23rd 1894 Will helped me wash in the morning before he went to plow. I churned and done up the other work. In the afternoon I cleaned of the cellar shelves and raked the yard east of the house till nearly supper time. a very pleasant day. Tuesday April 24th 1894 I ironed this forenoon besides doing other work. I worked all afternoon cleaning out the raspberry bushes west of the house. Will plowed the garden and we got some of it planted. weather pleasant. Wednesday April 25th 1894 I worked out doors all the forenoon. I reset some berry bushes and a hop vine and did some hoeing. Will went to town a little while when he came back we planted more garden and he fixed up the grape vines in the north yard. This is Charlie's birthday.